Texas is a large state with a wide variety of geographical features, ecosystems, and wildlife. Texas is also home to one of the nation's best state park systems, which offers wonderful public access to these natural resources. Located just north of Fredericksburg in the Texas Hill Country, Enchanted Rock is one of the largest natural rock formations in the United States, with a dome that rises 425 feet above the ground (1,825 feet above sea level). Designated as a National Natural Landmark in 1970, Enchanted Rock is also part of the Texas State Parks System and attracts thousands of visitors annually. Most people relate fall foliage and the changing of the leaves to the eastern portion of the United States. However, portions of Texas actually see dramatic changes in foliage coloration as fall draws near. Lost Maples State Natural Area in the Texas Hill Country has the most vivid fall leaf coloration in the state. 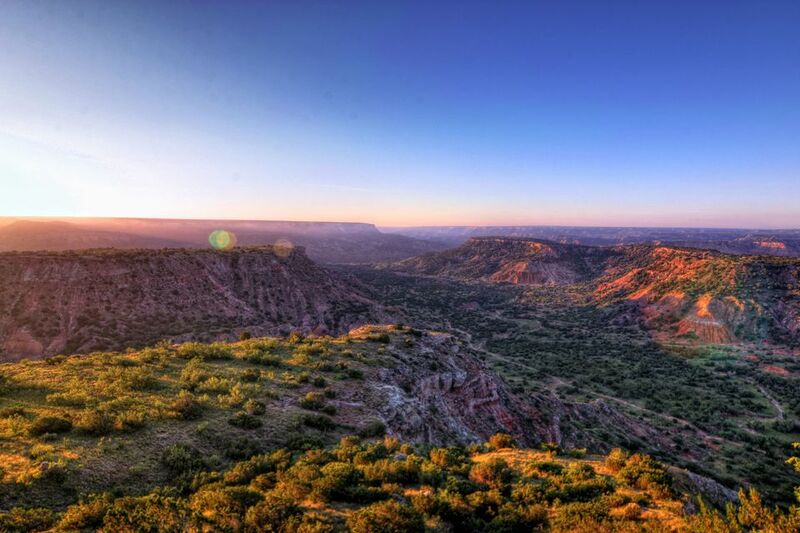 Known as the "Grand Canyon of Texas," Palo Duro Canyon is 120 miles long, 20 miles wide, and 800 feet deep. Palo Duro is one of the most popular mountain biking destinations in the country. Horseback riding, mountain climbing, camping, and hiking are also popular activities. Located on the Frio River in Concan, Garner State Park is one of Texas' most popular summer getaways. Whether it's swimming, fishing, paddling, or tubing, most visitors to Garner find a way to get on or in the water. However, there are also "dry" activities such as miniature golf, birding, nature trails, hiking, and more. Mustang Island State Park includes five miles of beachfront and offers visitors fishing, camping, beachcombing, swimming, surfing, birding, and other outdoor recreation options. Mustang Island State Park is also located just a short drive from the city of Corpus Christi. Longhorn Caverns are a Hill Country wonder that housed Comanche Indians, Confederate Soldiers and, perhaps, and outlaw or two. Today​ the site is a state park, offering a number of tours and educational programs. Visiting this underground attraction is a great way to beat the heat during the summer months in Texas. Located in Comal County in the Texas Hill Country, Guadalupe River State Park encompasses a nine-mile stretch of the Guadalupe River, offering park visitors plenty of swimming and tubing opportunities. Hueco Tanks offers a variety of outdoor activities, most notably camping and rock climbing. However, one of the biggest draws to this historic site are the prehistoric pictographs that dot the cave walls there. The other major draw is rock climbing, as Hueco Tanks is widely recognized as one of the top rock climbing sites in Texas. Located just north of Del Rio on Texas' famed Devil's River, the Devil's River State Natural Area offers a variety of outdoor activities in a remote setting. Canoeing, kayaking, mountain biking, hiking, fishing, and swimming are just a few of the many activities available. Washington-on-the-Brazos is the location where the Convention of 1836 signed Texas' Declaration of Independence from Mexico. The site also served as the Texas Capitol off and on through the early years of the Republic of Texas. Washinton-on-the-Brazos is a great place to visit in order to get a true feel for how Texas began.